Tabako (Tobacco) – Scientific name: Nicotiana tabacum L.
Tobacco has a long history of use by medical herbalists as a relaxant, though since it is a highly additive drug it is seldom employed internally or externally at present. The leaves are antispasmodic, discutient, diuretic, emetic, expectorant, irritant, narcotic, sedative and sialagogue. They are used externally in the treatment of rheumatic swelling, skin diseases and scorpion stings. The plant should be used with great caution, when taken internally it is an addictive narcotic. The active ingredients can also be absorbed through the skin. Wet tobacco leaves can be applied to stings in order to relieve the pain. They are also a certain cure for painful piles. A homeopathic remedy is made from the dried leaves. It is used in the treatment of nausea and travel sickness. 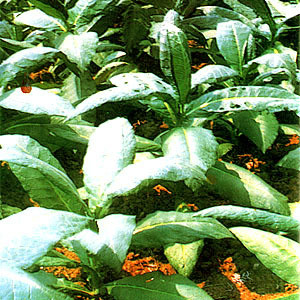 All parts of the plant contain nicotine, this has been extracted and used as an insecticide. The dried leaves can also be used, they remain effective for 6 months after drying. The juice of the leaves can be rubbed on the body as an insect repellent. The leaves have been dried and chewed as an intoxicant. The dried leaves are also used as snuff or smoked. This is the main species that is used to make cigarettes and cigars. A drying oil is obtained from the seed. This entry was posted in List of Medicinal Plants in the Philippines and tagged tabako, tobacco on March 30, 2009 by Pinoy Herbs.